This was the first proper Don Kerr show in Toronto. 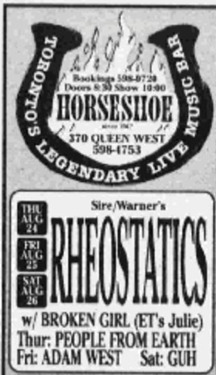 They had played the Roadside Attraction tour but this was the first in Toronto. It also features 4 songs played for the first time - Connecting Flights (aka Two Flights of Stairs), Four Little Songs, Sweet,Rich,Beautiful and Mine, and All The Same Eyes (aka Crescent II). Also the only known cover version of Joe Jackson's I'm The Man.